I am struggling to figure out what to do. I have already made a deposit on Brazilian Cherry hardwood. My living room is paneled with dark paneling – probably the color of walnut. The living room merges into a foyer that is a painted sheetrock wall. What do I do in this situation? 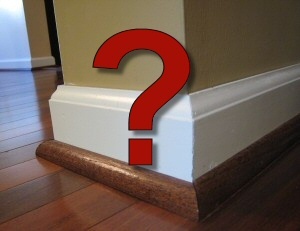 Lets take the living room first – what color of quarter round and baseboard should I use there? Now the adjacent area that is painted sheetrock – what color of quarter round and baseboard should I use? How about one more question: The living room goes into a kitchen that I plan to tile and a dining room is off of the kitchen. The dining room will be in the same Brazilian Cherry hardwood. This is a painted sheetrock room. What quarter round and baseboard would be good here? Thanks very much. I have been putting off getting the job done because of this issue. If I were old enough to flashback to the 70s, it would have happened right then. But seriously, anytime we see paneling our inclination is to replace it or paint it. Believe it or not, paneling will take paint quite well. We painted ours using two coats of Kilz Primer and Behr Eggshell Latex. The process is simple: lightly sand the surface with 120 grit paper. Apply two coats of primer, and paint. Choose a roller with a mat thickness that works with the depth of the ridges between the paneling (e.g., deep gaps between the panels requires a thick mat roller). If you choose not to paint the paneling, you’re going to have a major design clash on your hands. It’s hard to make the dark browns of a walnut paneling look good with the red hues of Brazilian Cherry. As far as trim colors, we think that trim colors should be uniform throughout the house (except perhaps for certain accent situations). We’ve got pretty traditional tastes, so a shade of white would be our preference. If we were to lay new Brazilian Cherry Hardwoods ourselves, we’d definitely go with a soft white trim and likely a matching soft white shoe molding as opposed to quarter round. We’d also choose relatively neutral paint colors that would allow the floors, wall decor, and fabrics to carry the day in the space. What do you think? What would you do in this situation? Weigh in an help Mike solve his design challenge. I agree, keep it consistent and get rid of the paneling! But, he is tiling the kitchen and laying hardwood in the dining room (you may have misread that part 🙂 ). Thanks for the feedback. I hoped to find a way to make the paneling work, one reason because I am getting close to the limit of my home equity loan. Another, it doesn’t look that bad, but then again, I may have trouble visualizing what the room could look like. If it makes any difference – one end of the room is brick with a fireplace and dark wood mantle. Would walnut flooring make any difference (instead of Brazilian Cherry) or is the paneling definitely out? Thanks again. Mike, in our opinion (and without knowing you), you won’t regret painting the paneling. It really just looks like a slightly textured wall when you’re done. If you do the floors in walnut you *might* be able to match the paneling, but the room will be very dark, and probably look like a very old cabin. Fred, due to the type of paneling I have, I just don’t think painting will work well. My paneling contains deep grain and also knots and knot holes. Thanks. No paneling! Please get rid of the paneling, dude. Brazilian Cherry is a beautiful floor, do not mix it with the paneling! Either paint the paneling or sheet rock over it and then finish and paint. You will love your floor if you do this. Good luck. Mike, I think you live in a house identical to my in-laws! Everything you say about your home exactly describes theirs. I finally convinced them to let me paint over their paneling and they love it! It brightened up the space and now their new bamboo floor doesn’t clash with the 70’s paneling! If you are worried about the grooves and knots you can use sheet rock mud to fill them in and then sand them down. It wasn’t worth it for me, but we didn’t have the knots, just the grooves. You might also try some Elmer’s wood filler for the knots and then prime and paint. I wouldn’t worry about the grooves too much. You’ll be so happy with how much light is in the space that you won’t even notice the grooves!